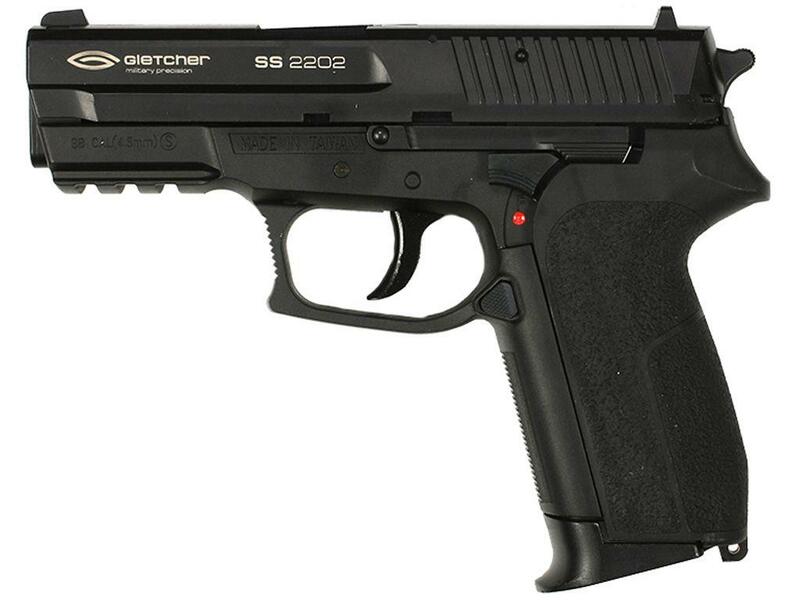 Gletcher SS 2202 4.5mm BB Pistol | ReplicaAirguns.ca | New Website! Trigger Pull: The trigger pull on the Gletcher SS 2202 is double action only but is very smooth and fairly light. It does allow for some pretty quick shooting even though it is double action only. When you pull the trigger the internal barrel moves back into the magazine while the internal hammer moves rearward and then releases forwards, striking the CO2 valve releasing CO2. It is a very simple yet effective design. Build Quality: Build quality was very good, I was extremely pleased with the fit and finish of my Gletcher SS 2202 BB Pistol! Realism: The Gletcher SS 2202 Pistol is very close to the look and feel of the real Sig Sauer SP2022 Sig Pro! For a lower cost airgun, I was very impressed with all the details and closeness to the real steel Sig Pro. There is no actual Sig Sauer licensing on the Gletcher SS 2202 but other than that it is pretty much identical in appearance. It would have been nice to have a working slide and slide catch release but at least you have the ability to take the slide off for cleaning and oiling if required. May have good FPS! Fingers crossed! This is my Official Field Test Shooting Review video for the Gletcher SS 2202 Metal Slide CO2 BB Pistol. You can also checkout my full review including a Field Test for the KWC SP 2022 which by the way is pretty much the exact same BB pistol but distributed by KWC rather than Gletcher. In this Field Test Shooting video I test out the performance of the Gletcher SS 2202 Metal Slide using my Chronograph to get a real world Feet Per Second rating, I also step back 30 feet and shoot 10 rounds at a paper target using a semi rested position (Sand bag up front and standing in the back). In terms of velocity the Gletcher SS 2202 Metal Slide CO2 BB Pistol performed very close to the KWC SP 2022 review I did earlier shooting as high as 468 fps. I did have some chronograph miss-readings that made the average come down a bit but I would say a flawless string of readings would have been around 450+ fps. Stepping back 30 feet and shooting at my paper target, the Gletcher SS 2202 CO2 BB Pistol produced a respectable 4 inch grouping that was just a little to the left but not by too much. I really like the trigger on the Gletcher SS 2202 CO2 BB Pistol, for a double action only pistol it is very smooth, light and not overly long! The release is very predictable and there is zero stickiness in the first stage. The fairly high fps for a shorter barrel pistol is most likely due to a more than average amount of CO2 released per shot but even so you can expect close to 100 shots per CO2. If you plan on using the Gletcher SS 2202 in your back yard, keep in mind that it is louder than most CO2 BB pistols, it really gives a nice loud crack with each shot. All in all a real decent performance out of the Gletcher SS 2202 Metal Slide CO2 BB Pistol, if you are a Sig Sauer fan like I am then this Sig Pro replica is a no brainer to have in your collection! -Non-blowback: single and double action. -21 Round full size drop out magazine. This video is a walk through review of the Gletcher SS 2202 Metal Slide CO2 BB Pistol. I show off this BB Replica close up from all angles and point out the mostly metal construction and go through the features and benefits of this modern Sig Sauer Replica pistol. I also Field remove the slide on the SS 2202 in this video.